Import cargo clearance in Pakistan Customs. What is the customs process in Pakistan to import? How is import cargo released from Pakistan Customs to importer? Who are the parties involved in import customs clearance formalities in Pakistan? 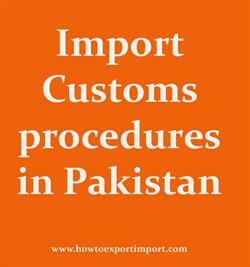 The information provided here details on how to import goods to Pakistan especially import customs clearance procedures in Pakistan. Pakistan Customs is the gatekeeper of Pakistan borders against transit of illegal products, controls smuggling and is facilitator of genuine trade. It works under the Federal Board of Revenue that managed by the Ministry of Finance. Which documents should I provide at Faisalabad customs port location for import. Documents need to move cargo out of customs at Gwadar port customs location. Import documentation in Bahawalpura port customs. What are the documents required to import in Dera Ghazi Khan. What are the import document processes need to carried out with Faisalabadc customs. Required documents to import in Dera Ghazi Khan port. Customs documentation requirements to import at Islamabad port. Documents required to submit with Bahawalpur customs for importation. Documentation procedures for import at Lahore customs. What are the documents need to be submitted to import at Dera Ghazi Khan port customs. How to export from India to Pakistan? HS Code, ITC Code, Schedule B, are all same?